Koyikkal Palace, situated at a distance of 18km from Kerala’s capital city of Thiruvananthapuram, is an important tourist attraction where history slumbers in all its pristine glory. The palace is a double-storey building, built in the conventional nalukettu architectural style of Kerala with sloping gabled roofs, and large rooms built around an open central courtyard. 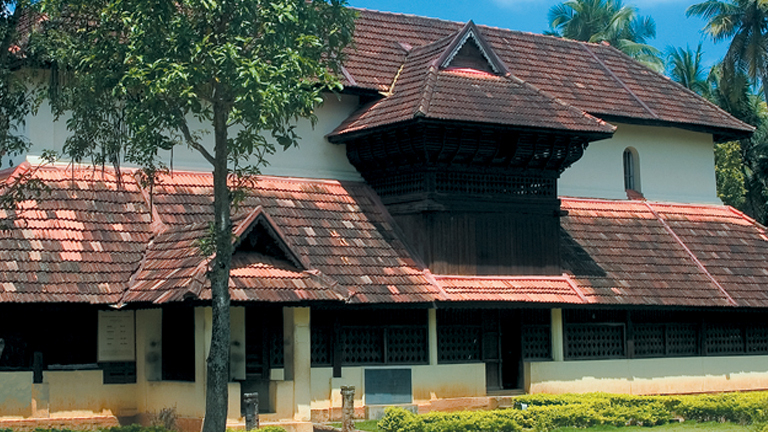 The ground floor of the palace has a Numismatics Museum, the only one of its kind in Kerala. It has got a rare collection of coins from all over the world, including those of countries like Holland, Portugal, Britain, Rome etc. These coins point to the trade relations Kerala then had with those countries. A Venetian coin by the name Amaida, believed to have been gifted to Jesus Christ, is a prized specimen of the museum. Equally valuable is a collection of 374 Roman gold coins, with the pictures of Roman Gods and Goddesses like Mars, Hercules, Venus, Ceres, and Genius, and the ruler Hardin stamped on them. The museum is home to very old Kerala coins like Kaliyugarayan Panam, Otta-puthen, Eratta-puthan etc. Kochi-puthen, a coin in circulation in the kingdom of Kochi, and Indo-Dutch-puthen, a 1782 AD variation of it, are also found here. (In Malayalam, the word puthen means ‘new’. Every time a new coin was issued, the authorities probably named it in different variations of the word puthen.) The museum has Kerala Rasis which are among the smallest coins found anywhere in the world, along with Sreekrishna Rasi that were minted in Kerala in the 10th century, Lekshmi Varaham the Travancore silver coin, Ananthanarayan Panam the Travancore gold coin during the 15th and 17th centuries, and the coin-counting wooden board known as Rasi Palaka with depressions designed to enable fast counting of small coins. Coins that were in use by rulers of the kingdoms like Gwalior, Hyderabad, and Mysore, plus the Karsha coins dating back to about 2500 years are among the other attractions here. The museum was established by the Department of Archaeology. On the first floor of the palace is the Folklore Museum founded in 1992. The objects displayed here, like occupational tools, household appliances, musical instruments, and folk art representations, together form a microcosm of the rich cultural heritage of Kerala. Among the prime attractions of the museum are a percussion instrument called Chadravalayam, used as accompaniment during the performance of Ramakatha Paattu, a folk art form involving the recital of the story of the epic Ramayana, and a stringed, wooden musical instrument called Nathuni, used as accompaniment to Nanthunippattu and Onappattu, the songs sung during Onam, the royal festival of Kerala. Old pieces of Maravuri, or clothing made of tree barks, Thaliyola books (manuscripts written on dried palm leaves), the anklet or Chilambu used by Umayamma Rani herself, and Oorakkudukku, a contraption for exercising the intellect, have all been preserved here in excellent condition. Beautiful lamps and elaborate dance attires were the hallmarks of Kerala temples, and these too find representation in the Folklore Museum. Gajalakshmi oil lamp made with the image of Goddess Lakshmi seated atop an elephant, and kettuvilakku are examples of Kerala’s traditional lamps. The former was lit at twilight during the harvest seasons to hail the Goddess and a bountiful harvest, and the latter was lit in Southern Kerala temples dedicated to Goddesses. The elaborate headgear and costume worn by performers of Ottamthullal, the satirical performing art, and models of Theyyam, a ritualistic performing art of Kerala, representing interesting folk deities like Padayani Kolam and Muthappan Theyyam are displayed in the museum. To cap all this is a fine collection of brass, copper, and wooden kitchen equipment that give the viewers a peep into the culinary styles and many mundane habits of the people of a bygone era.